The newspapers suddenly began writing about June's transit of Venus on Wednesday, May 8th of 2004. Why? Because the Royal Astronomical Society issued a press release about it on this date. As the day of the event grew closer, and the facts disappeared deeper and deeper into filing systems, the hype began. Of course, transits of Venus are not common events, like eclipses caused by the Moon. The last one was on 6th December in 1882, which meant that no living person on the planet had seen a transit before today's, and the last one visible in its entirety from the UK was in 1283 (when no one knew it was happening). And as the next transit of Venus visible in the UK will not be until 2247, it was a question of miss this one and you'd had it! But a transit is hardly the spectacular event that some hacks were unloading on their readers. Naturally, Tuesday June 8th started off with enough cloud about to reinforce the native pessimism of experienced observers of astronomical events in Romiley. The day was bright enough but the sky was white rather than blue and those wandering around in sunglasses could see lower clouds hovering in front of an overall background of hazy, high cloud. The Sun did eventually burn off the haze and find its way into gaps between the lower clouds. Even so, the event was entirely missable because Venus passing in front of the Sun is hardly in the same class as the Moon crossing in front of our star. Anyone trying to see the transit using a conventional eclipse viewer of aluminized plastic film, or over-exposed photographic film, was out of luck. The tiny dark spot that was Venus wasn't big enough to be visible to the average naked eye. A pinhole in a piece of card was similarly ineffective in projecting an image big enough to show anything. The two images shown above were produced using binoculars. 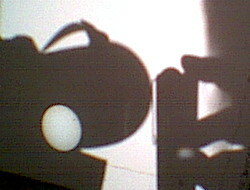 The sun's image was projected into the shadow of the binoculars on a large piece of card. A large card was necessary because we didn't have a clamp and holding heavy binoculars steady is no easy job. 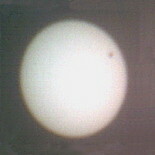 The system is captured in the title picture at the top of the page, which shows the sun's image with Venus in transit on the shadow of the binoculars, and the shadow of the pen camera. 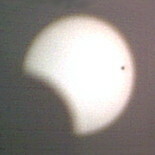 The projected images are inverted, which is why Venus; the tiny dark blob; is seen at the top right of the pictures rather than the bottom right. They were captured using a digital pen camera of the type used by members of Romiley Arts Federation to record the history of Romiley's new lamp posts. Finally, the image on the right was preserved from the large number of pictures taken in the hope of getting some that could be used. The shadow of the pen camera has created a bogus eclipse picture which seems to include a large sunspot. Views at 5:26, 5:29, 5:30 & 5:34 a.m. on June 6th 2012, all times in B.S.T. The first transit of the pair was very much a do-it-yourself affair. The second, eight years later, was puffed and hyped mercilessly on TV, and covered in its entirety on the Internet for those with the stamina to stay up all night. The newspapers devoted a surprising amount of space to the event, but not so much on June 6th as they were too busy overloading their public with vast pictorial supplements on the Queen's Diamond Jubilee. Their websites, though, did make an effort. As it was night in England when the transit began, we were relieved of the responsibility of having to mount a pair of binoculars in front of a suitable screen. Seeing the transit was just a matter of switching on a computer or two, and paying attention to the beginning and the ending, and getting up for a look at the middle. The only moderately hard thing to do was keep up with what NASA Edge in Hawaii was showing us. Their pictures started with Venus making contact with the Sun in the bottom left quadrant instead of the upper left, i.e. with the Sun's south pole at the top. And after a technical breakdown, the show resumed with the Sun tilted on its side with the north pole to the right. 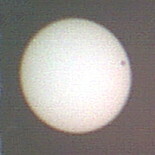 Thus the transit was from top to bottom instead of from left to right. Most curious. Anyone who struggled out of bed at 5 a.m. hoping to see something here would have been disappointed. Romiley was socked in by clouds. And there were even a few lurking around over Hawaii as the transit was finishing; but they soon blew away. So that's it for transits of Venus until 2117, but anyone who happens to be on Mars in 2084 will be able to see a Transit of the Earth. And, no doubt, it will be on whatever the Internet has become by then for the benefit of the Earthbound.